Our new Cliche Service: If you deliver us a ready film or a file with your print image which can be used directly for the film manufacturing, you only pay our attractive package price for our Cliché Service. If you send us an artwork, a drawing or a file, which has to be graphically handled, prior to the film production, we will invoice you the effective working time for the graphic artworks plus the normal package price for the cliché service including cliché, film material and etching. The price for the cliché service is depending on the chosen plate type and the plate size. The exact prices we will give you on request. Our additional service: If requested and against a surcharge, we will expose or etch plates within 24 hours for you (valid for plate sizes being in stock and orders without graphic artwork). In this way, your cliché order is ready to ship within 24 hours after receiving your purchase order and your film or file. 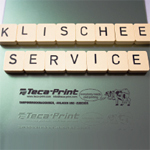 Prior to the introduction of our improved cliché service, we have completely reorganized the rooms of our cliché service and equipped with the latest technical units for the exposing and etching of plates. Take use of our attractive offer and test us!